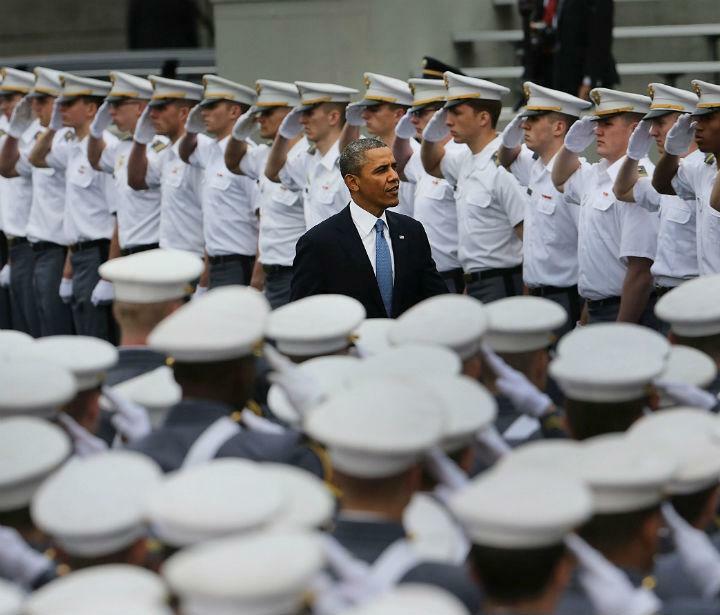 The ComplexPresident Obama told a crowd of cheering cadets at West Point that the U.S. remains an “indispensable nation” that will face down terrorism threats around the world and work to bolster key allies while avoiding costly, open-ended wars. But amid Republican criticism that Obama has diminished America’s standing globally, the high-profile address likely handed his opponents new support for their claim that he’s more interested in a domestic agenda than one in which he’d be willing to intervene in a place like Syria, now in the third year of a bloody civil war. Obama, speaking at the U.S. Military Academy’s commencement ceremony, said terrorism remains “the most direct threat to America at home and abroad” and stressed that the U.S. won’t refrain from taking direct action against militants if it has actionable intelligence. He also announced a new $5 billion counter-terrorism fund conceived to help the U.S. train allies in the Middle East and North Africa so they could battle their own home-grown extremists with little to no U.S. help. Administration officials pointed to Africa, where the military has ramped up its efforts to help the militaries of countries like Mali, Chad and Niger. The president’s remarks came just one day after he announced a new plan for Afghanistan in which some 9,800 troops would remain in that country after 2014 to train the Afghan security forces and mount counter-terror operations, but with all but a handful of security forces supporting the embassy withdrawing by the end of 2015. Although there has been speculation for weeks that the White House would expand its program to train and arm the Syrian opposition, and perhaps Obama would use Wednesday’s speech to outline it, Obama was decidedly non-committal. The administration has long stressed that the U.S. military wouldn’t intervene in the conflict and that it was committed to a diplomatic solution to the brutal civil war. Those efforts have collapsed in recent weeks, but Obama didn’t acknowledge that diplomacy was no longer making any progress and offered only broad brushstrokes about what the U.S. would do to help. “This is something we’ll be discussing with Congress in the coming weeks and months,” the official said. Some of the details that did emerge during the speech also undercut some of the president’s own arguments. Some of the money in the new counter-terrorism fund would help pay for humanitarian assistance in Lebanon, Turkey, Iraq and Jordan, all of which have seen the spillover effects of the Syrian war in the form of hundreds of thousands of Syrian refugees. That could reduce, perhaps substantially, the amount of money that would go towards training and equipping allied armed forces. Typical of Obama’s vision of the use of military forces to “build capacity” among partner nations is a plan underway since last year in which U.S. Special Operations troops are creating elite counterterrorism units in North and West Africa, including Libya, Niger, Mali and Mauritania. The program, first reported by the New York Times this week, uses the Army’s Green Berets and the secretive Delta Force to help create indigenous forces capable of fighting militants in those countries such as those from Boko Haram, an Islamist group that kidnapped about 275 schoolgirls in a remote region of northern Nigeria. “I believe we must shift our counter-terrorism strategy – drawing on the successes and shortcomings of our experience in Iraq and Afghanistan – to more effectively partner with countries where terrorist networks seek a foothold,” Obama said, noting how such moves are a reflection of today’s “principal threat” comes from a decentralized al Qaeda in which the group’s affiliates and other extremists pose the biggest threats in those countries. As Foreign Policy first reported in November, the expected migration of most drone operations from the CIA to the Defense Department has been on hold for months and is still not expected to happen anytime soon. CIA operations fall under what’s known as “Title 50” operations and are therefore covert; Defense Department drone operations are, for the most part, overt and therefore subject to more Congressional oversight. Obama’s reinvigorated efforts to have more operations overseas out in the open come as Sen. Rand Paul, the Republican from Kentucky, threatened to hold up the judicial nomination of David Barron, who wrote a legal opinion in support of the Obama White House’s killing of American Anwar al-Awlaki in Yemen in 2011. Barron was ultimately confirmed on a party-line 53-45.